Cover use and flocking in birds is closely tied to foraging efficiency and risk of predation. Foraging efficiency tends to be higher and risk of predation lower (in some species) in flocks, especially in mixed-species flocks. 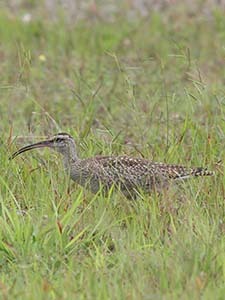 Birds foraging in the open or on short cover tend to forage more efficiently, but the risk of predation there is generally higher than in tall cover. I studied shorebirds foraging in agricultural fields on Virginia’s Eastern Shore to determine cover use and flocking patterns of these birds, and to evaluate whether or not these foraging behaviors were consistent with predictions based on foraging efficiency and predation risk. Shorebirds were common in the study area in spring, fall, and winter. Most species exhibited a positive association with plough and a negative association with >10 cm cover, while the associations with <10 cm cover were varied. In most species, relative cover use remained constant from one season to the next on plough and >10 cm cover, but on <10 cm cover more species exhibited a positive association in spring than in fall or winter, possibly due to crowding effects on plough during spring. Most species preferred plough or short cover, where they may have been able to forage more efficiently than on tall cover. Almost all the individuals observed were foraging in flocks, and most species were positively associated with mixed-species flocks and negatively associated with monospecific flocks. These associations were consistent during all seasons and on all cover types. Foraging in flocks probably reduced the risk of predation, allowing the shorebirds to forage on plough (where they were more visible to predators). Choice of cover involves a tradeoff between foraging efficiency and predation risk. I concluded that these birds were probably able to forage on plough (where foraging was most efficient) because alternate foraging strategies (e.g. flocking) increased their safety from predators. In addition, flocking probably enhanced not only the birds’ safety, but also their foraging efficiency.